A political war situated in Fort Bend County, Texas, the feud was between the existing Republican Reconstruction government and the vying Democratic party for political control of the county. It began with the political election in 1888, pitting the “Jaybirds,” a Democratic group who represented wealth and about 90 percent of the white population, against the Republican government, referred to as the “Woodpeckers,” who had gained control during Reconstruction. The “Woodpeckers” also claimed to be “Democrats,” but they represented the Republican Reconstruction and had been elected primarily as a result of the black vote for the Republican ticket. According to legend, the conflict allegedly got its name from a local “half-crazy” black man who was said to have been constantly singing about jaybirds and woodpeckers. For whatever reasons, the Democrats identified themselves as the Jaybirds. As the election neared, debates began to rage between the two factions, pitting former friends, neighbors and relatives against each other. These heated arguments came to head when J.M. Shamblin, the Jaybird leader, was killed on August 2, 1888. The next month, another Jaybird leader named Henry Frost, was seriously wounded. 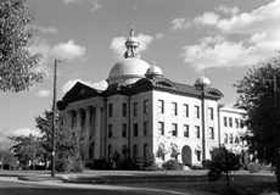 The Jaybirds soon held a mass meeting in Richmond, Texas on September 6, 1888 and resolved to warn certain black people in the county to leave immediately, which they did. Soon Texas Rangers would be stationed in Richmond as members of both parties began arming themselves. When election day came around that November, the heaviest vote in county history was polled, with the Woodpeckers retaining control, and although the election went peacefully, the breach between the two factions widened. The threats and assaults continued, and two more killings occurred as the county became an armed camp. On August 16, 1889, the heated exchange culminated in what has become known as “Battle of Richmond.” It started when shots were exchanged by two members of the Woodpeckers against two of the Jaybird faction near the courthouse and the National Hotel. In no time, the ranks of both sides were fortified with additional members and their blazing guns. After exchanging shots for about twenty minutes, and leaving a number of dead men on the ground, the Woodpecker men retreated and left the Jaybirds in possession of the town. Jaybirds from all parts of the county hurried to Richmond in anticipation of further hostilities, but the smoke had settled. Upon hearing of the altercation, Governor Lawrence S. Ross sent in the Houston Light Guards and the Brenham Light Guards to establish martial law the next day. The governor also came to Richmond, and acting as mediator, a complete reorganization of the county government resulted in the removal or resignation of all Woodpecker officials and Jaybird members in office. In October, the Jaybirds formally organized the Jaybird Democratic Organization of Fort Bend County, a permanent organization whose purpose was to maintain white control by denying blacks entry into the organization. This organization would dominate local politics for the next several decades, until in 1953, in Terry v Adams, the United States Supreme Court ruled that the Jaybird Democratic Organization violated the 15th Amendment of the U.S. Constitution, ratified in 1870, which says that the right of citizens to vote shall not be denied or abridged by the US or any State on account of race, color or previous condition of servitude.